D-Link DSL- 34 2320B ADSL2+ Ethernet/USB Modem MAC filtering can forward or block traffic by MAC address. You can change the policy or add settings to the MAC filtering table using the MAC Filtering Setup screen. If you click Change Policy, a confirmation dialog allows you to verify your change. Select Yes to continue, or No to to cancel. If you want to add an entry to the MAC filtering table, Select Add from the MAC Filtering Setup screen. The Add MAC Filter screen should then appear. Select a Protocol Type, enter the Destination and Source MAC address, the necessary Frame Direction, and WAN interface (bridge mode only). Click Apply to save. After you save the settings, a screen showing the settings will appear. On this screen you will be able to view and delete MAC filtering rules. 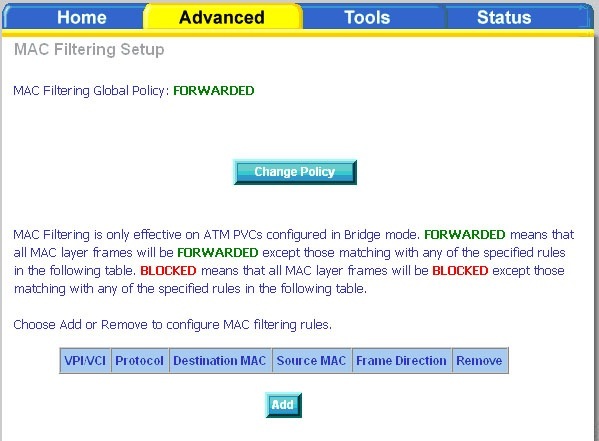 In computer networking, MAC Filtering (or EUI filtering, or layer 2 address filtering) refers to a security access control methodology whereby the 48-bit address assigned to each network card is used to determine access to the network. While giving a wireless network some additional protection, MAC Filtering can be circumvented by scanning a valid MAC (via airodump-ng) and then changing the own MAC into a validated one. This can be done in the Windows Registry or by using commandline tools on a Linux platform. Step 1: Open a web browser and type the IP address of the DWL-2700AP in the address bar (default is 192.168.0.50). Press Enter. Step 2: Enter your username (admin) and your password (default password is blank). Click OK to continue. Step 3: Click the Advanced tab and then click Filters to the left. 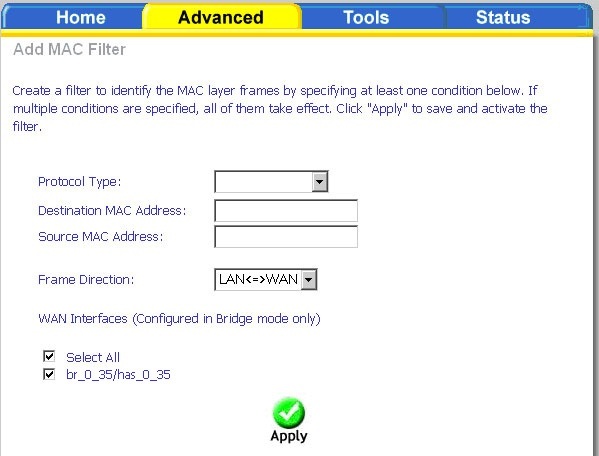 Step 5: Enter the MAC address of the wireless adapter(s) that you wish to Accept or Reject. Step 6: Click Apply and then click Continue to save the new settings.